Wash and cook the dal with enough water, in a pressure cooker. In a bowl add atta, ghee, ajwain and salt. Mix well and add water little by little to make it a stiff dough. Boil and mash the potato. Grind the ginger, garlic and green chili into a paste. In a bowl add the mashed potato, ground paste, cumin powder, coriander powder, salt, asafoetida and amchoor powder. Make equal big lemon sized balls of the dough. Using your hands make a dent in the middle for stuffing the potato. If you are not making any stuffing, just make the dough into balls and continue with the baking process. Stuff little potato mixture into the dent. Close it carefully and make it like a ball. the same procedure how we do for aloo paratha. Grease a baking tray and bake in a preheated(5 minutes) oven at 160 degrees for 45 minutes or till the top portion becomes golden brown. Mine got over by 35 minutes. Brush it with ghee before you put it into the oven. While it is getting baked, let's keep the dal ready. Add ghee in a pan. Slice the garlic into thin long pieces. Add turmeric powder, red chili powder, salt, broken red chili and garlic to the pan. Keep the flame low and do not get it burnt. Add the cooked dal to this and add 1 cup of water. Boil this for 5-7 minutes and switch off the flame. 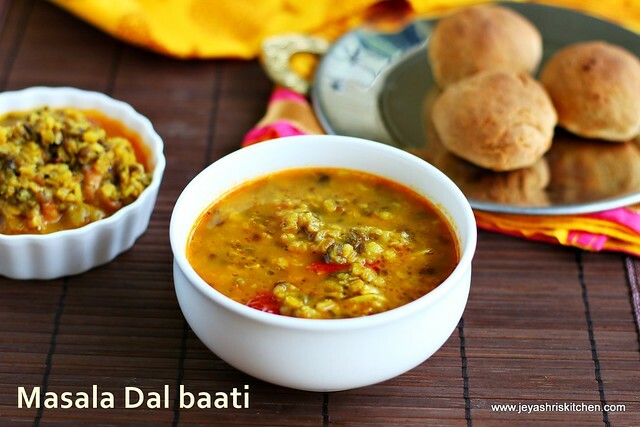 Dal is ready and baati is also ready. Let's assemble the dal baati. Break the baati with your hands and add it in a bowl. Pour hot dal on this and spoon in the ghee . I changed the serving plate while taking the main pictures of the dal baati recipe. 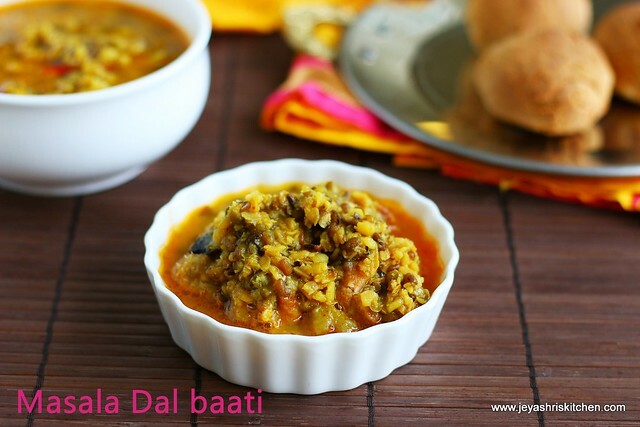 You can make this dal baati without stuffing. Simply bake the baatis after kneading the dough. Instead of potato paneer can also be stuffed inside. If you do not have an oven, drop the dough balls in oil | ghee and deep fry. In case you are following this make flatten the balls slightly, so that it will make the process bit quicker. Quick question - what if I don't have an oven? Can I deep fry the baati? Vow! wholesome meal by itself! Will definitely try this. Never knew that the baati can be baked, which makes it healthy. Thank you Jeyashri, your clicks helps in making it look easier. One question, can we not use the full moong?? The temperature you have mentioned is 160 celsius or Fahrenheit?? Split yellow moong only or whole green moong can also be used?? ?